This is the first in a series of posts about producers I met in Pitti and Florence more generally. Maffeis is part of a family of companies around Bergamo, in northern Italy. Another is Bresciani socks, which of course I’ve visited and written about before. 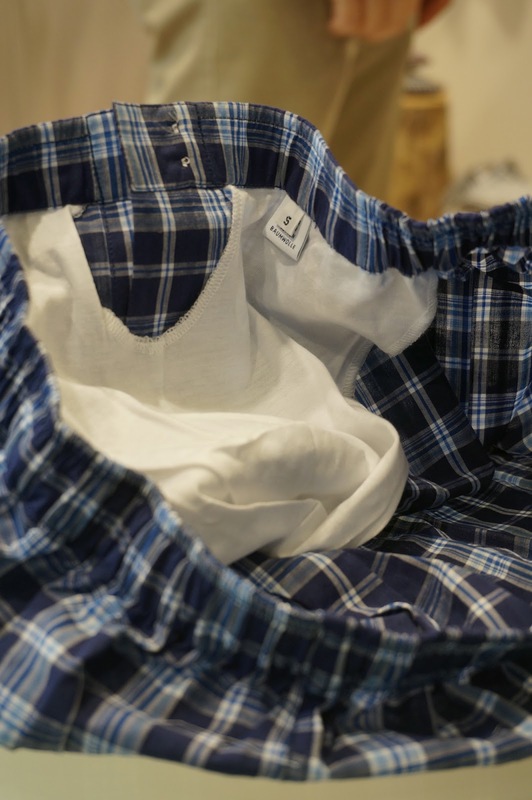 Both companies were founded after the war and are now run by the second generation – Massimiliano Bresciani, who was launching his new underwear at Pitti, and Paulo Maffeis. Both founders are still around and have a particular role in quality control at the factories. Maffeis employs around 32 people, all making shirts to a range of qualities. Every shirt is hand cut, but the amount of hand stitching varies. That amount is largely chosen by the shop that chooses to stock the shirts – Maffeis is sold in many stores in Belgium, Holland, France and Italy under its own brand, and by several UK brands under their label. Customers that opt for made to measure in these stores can also pick the amount of hand stitching they want. You can just have hand-sewn buttonholes, what I would call the functional hand stitching (collar, sleevehead) or everything. The price will range from about £200 to £300 with that choice of handwork. The amount of detail offered to made-to-measure customers is huge. There is no strict bespoke service, with an individual pattern, but things like the collar stand are stated in centimetres and can be adjusted to any height. Like many Italian bespoke shirts, the collar stand is also set to be smaller at the back and larger at the front, to stop the front of the collar from collapsing. Two little innovations caught my eye too. One was a small section of rougher cotton in the middle of the collar (above) which is intended to stop the tie from slipping and was invented by the founder, Emanuele. Another is the Maffeis boxer shorts (below), which incorporate a small cotton lining at the front to provide a little of the support you get with a brief. I don’t wear boxers, but this solves one of my problems with doing so. Maffeis makes great shirts and some nice knitted products – it recently rescued a local knitting company from bankruptcy and now offers cashmere shirt-jackets. You can follow the discussion on Emanuele Maffeis shirts by entering your email address in the box below. You will then receive an email every time a new comment is added. These will also contain a link to a page where you can stop the alerts, and remove all of your related data from the site. Bresciani UNDERWEAR? Please, tell me more! I am ready to kiss Zimmerli good-bye. I would love for sock and underwear shopping to be one-stop with Bresciani. Simon, would you consider Maffeis a good value shirt at the low end of the price range, i.e. without all the hand work? I’m looking to replace my T&A stock special shirt for some shirt with a more “italian” collar option. Maffeis shirts come strongly recommended from my side. Have over the years purchased quite a collection of their shirts; being based in Antwerp, Belgium where they are stocked at Oger store helps, of course. They are now my “standard” go-to business shirt. Particularly love the fabrics, which are rather “structured” in feel, with beautiful finishings at sleeves etc. For those traveling to Belgium or Holland regularly: Paulo visits the Oger stores in A’dam and Antwerp a few times every year for made-2-measure shirt orders. Worth the trip… PS: You can also order shirts from the Maffeis website (or Oger web shop). Personally I’m not a fan of either voile or batiste. They’re not necessarily see through, but I don’t particularly like the texture or find them that much cooler. Lighter weight cottons are normally fine (though often more expensive) or I would go for a linen or linen/cotton mix, as you suggest. We would suggest a Oxford weave cotton for a hot climate or if your budget cant stretch to it how about Monti 200 series cotton or a Thomas Mason 160. You need to look for a high count cotton in an open weave. thanks bob. interesting about the oxford suggestion – i always thought these were heavier and less tropical/summery than poplin. the last two would certainly be of interest, as long as they are not too sheer. the high counts are usually front and centre on fabric labelling but how does one tell how open the weave is? furthermore, does two-ply make it heavier and less breathable (physically i imagined so)? thanks! Yes, it’s a mixture of the weave and weight of the cloth that determines how well the shirt performs in heat. A pique cotton, as used in polo shirts, is not particularly light but it has an open weave. Just looking closely at the cloth is enough to determine that. Interesting. Picked up a zephyr’ pale blue from emmett which is excellent. Not sheer and much lighter than standard poplins. A wonderful pale blue fabric with a hint of fil-a-fil. Also picked up a cotton linen mix from them as well to try out in the heat. Emmett was very impressiBeing a brit with roots in italy, ive often struggled with most of the jermyn street shirtmakers and their rtw shirtmaking. Emmett seems to be doing the best to bridge the gap. Very impressive. Surprised ive overlooked them until now! Sounds like they don’t have much of a fixed style, and dictating that can be tough. You should be able to change almost everything at the first fitting, but not much at the second. Maybe bring in some pictures or other suits you like to help give them an idea? No one carries them here, apparently they’re not that popular.